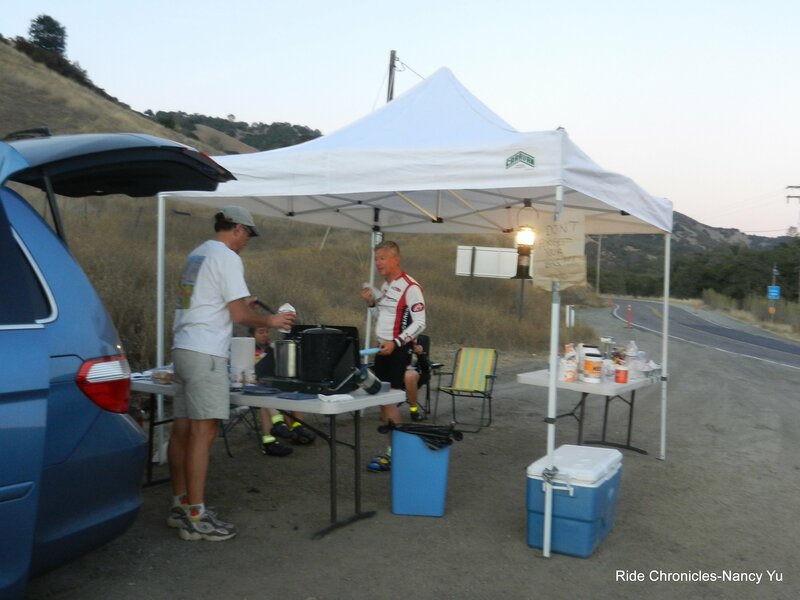 This year, Michael and I are volunteering to work the day of the event ride at Rest stop #1 and helping with pre-registration the evening before. 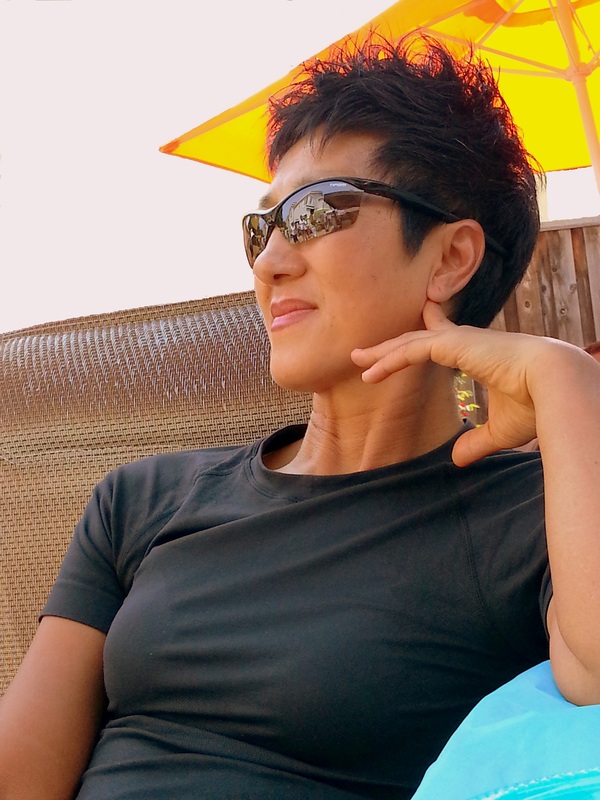 I believe in the concept of taking the time to “give back” and pay it forward. It’s a wonderful way to keep myself in check and also helps to keep my life in balance. The staff ride starts at the Pena Adobe Park in Vacaville. The loose time start is between 4:00-5:00 AM. Micheal and I arrive at the park a little before 4 AM. We check in and receive our numbered bib. 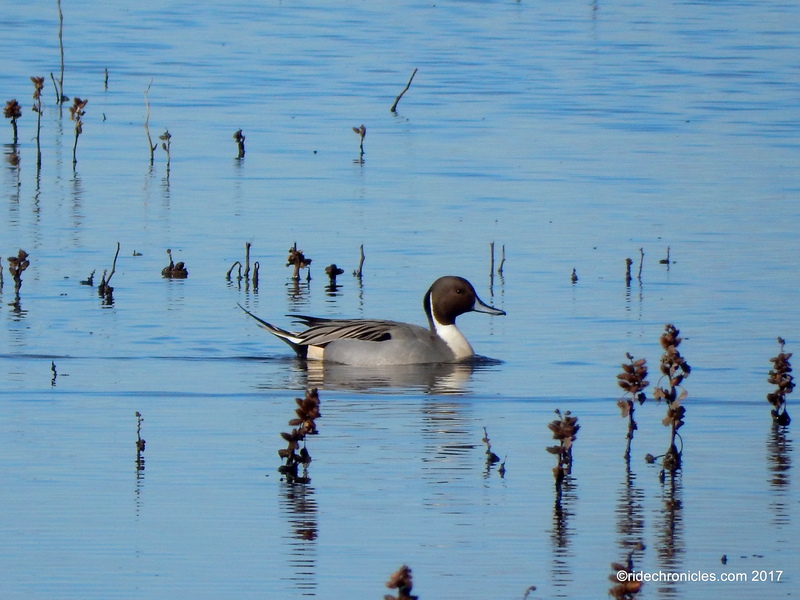 There are 37 riders this year; which is a new record for a Quack staff ride. Scott will even be out on the roads riding along with his fellow volunteers. The route we take is the same as the event ride. There is one course change this year. 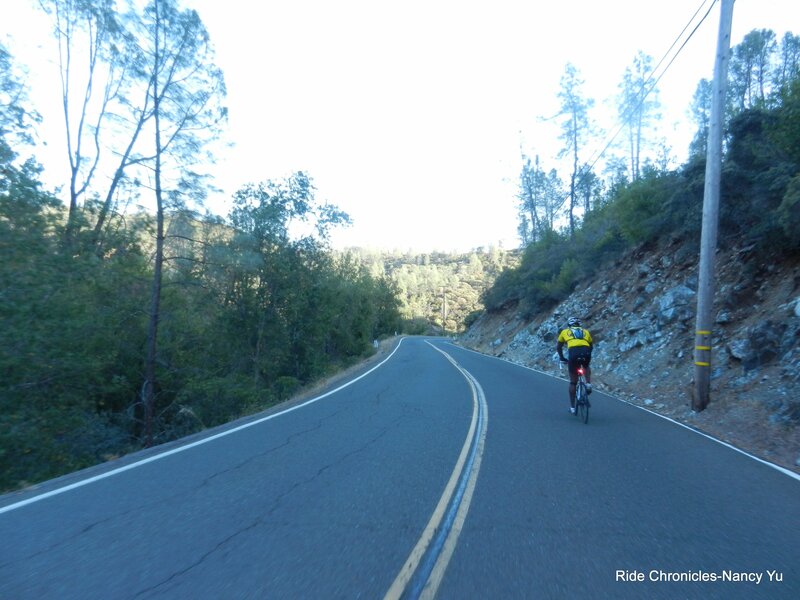 Due to the development of a large crater on Old Howell Mountain Rd this year, the route will have us going up Deer Park Rd. It adds about 2 miles to the course and is a much gentler climb. It will rejoin the regular course at White Cottage Rd. I usually have a bit of butterflies in my stomach before any double century and this morning it’s different. I feel really relaxed and am looking forward to a good day of riding. 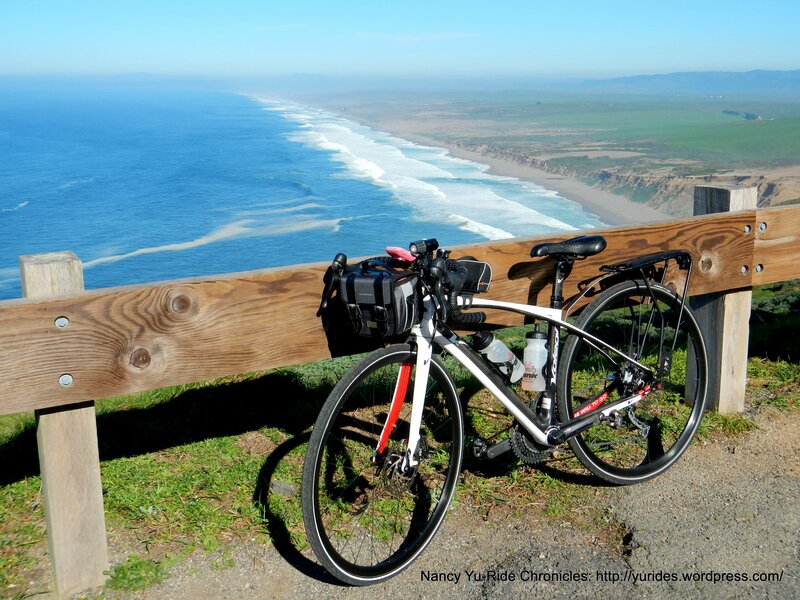 The staff ride is not timed and there’s no cut-off at any rest stop. Knowing this relieves me of the pressure and stress of having to be at a certain point at a certain time. The volunteers will be out there to support us through the whole ride. THANK YOU QUACKS! 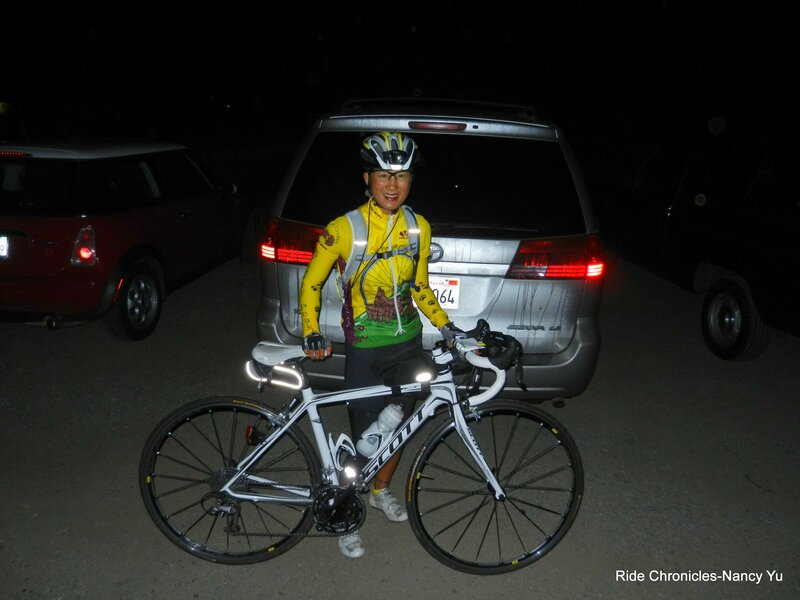 We roll out at 4:16 AM, temp 57F and do a quick loop around Lagoon Valley Park. 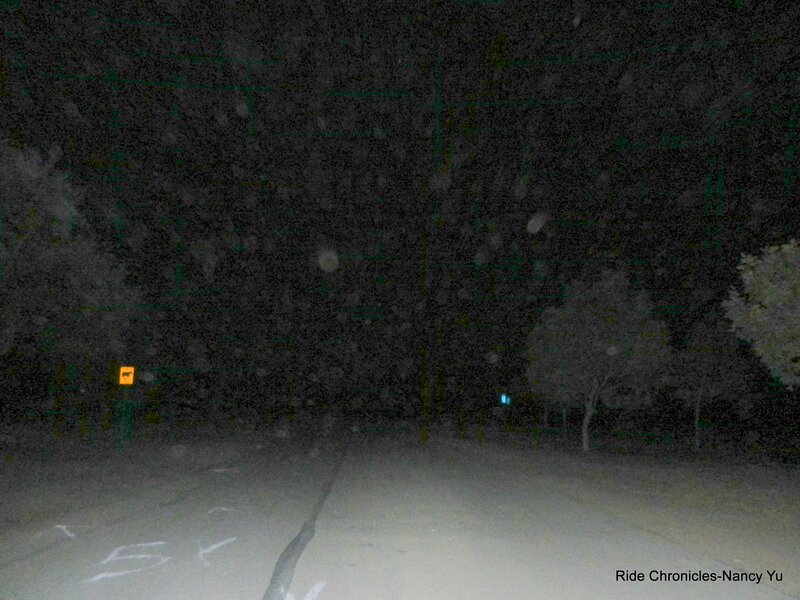 I catch a glimpse of a rabbit hopping across the road and can hear the sounds of crickets. We exit the park and cross the Fwy overpass to Lyon Rd. Lyon Rd parallels I-80 and take us through the residential neighborhoods on Hilborn and Vista Grande. The road is wet due to the all timed water sprinklers being on. We continue on Waterman Blvd to Mankas Corner/Abernathy Rd. We stay on Gordon Valley Rd for the next 3.9 miles. It really dark out and the moon is nowhere in sight. It’s a bit cooler back here; the temp has dropped to 51F. I’m riding in the front and Michael tells me that he can feel the heat emitting from my body while he’s riding behind me. Who would’ve known that! I see a deer crossing the road and catch a long whiff of the natural smell of skunk. As we’re going along. I know there are other others coming up on us. 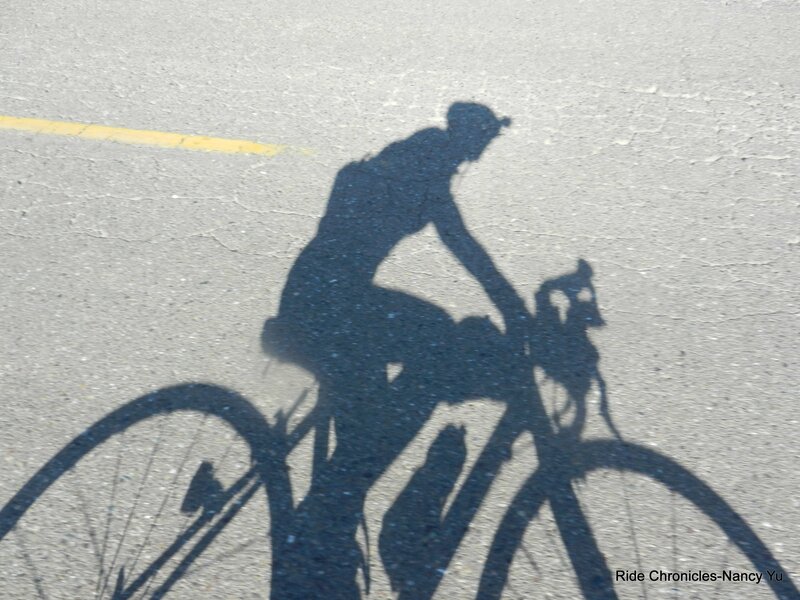 The beams of light from behind cast a glow along the embankment of the road and create shadows of us riding. It’s pretty cool; it’s like watching a outdoor movie! We take Wooden Valley Cross Rd to Wooden Valley Rd. It’s after 5 AM and there are a slew of big trucks passing us with boats in tow. They’re definitely getting an early start out to the lake. Looking above and beyond, I can see the bank of fog looming ahead of us and we’re heading that way! 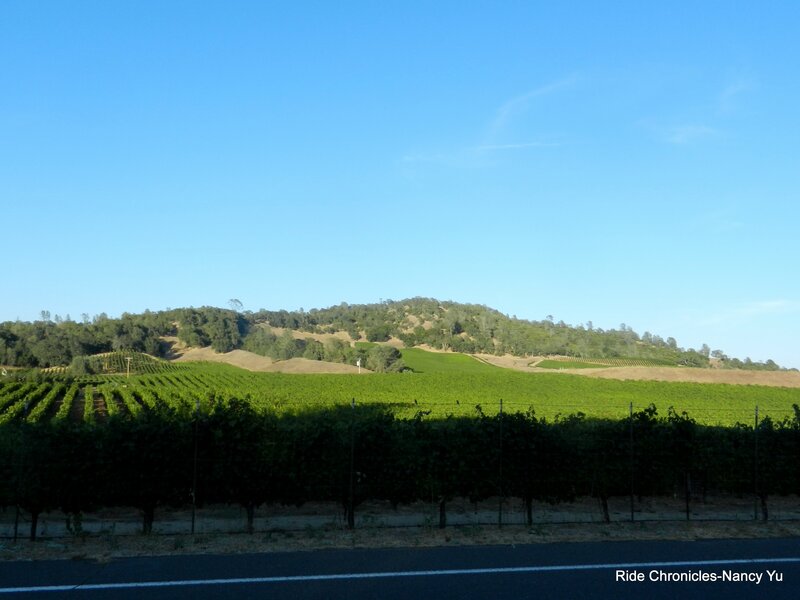 We reach the intersection at Hwy 121 and go up and over Mt George to the Napa Valley. 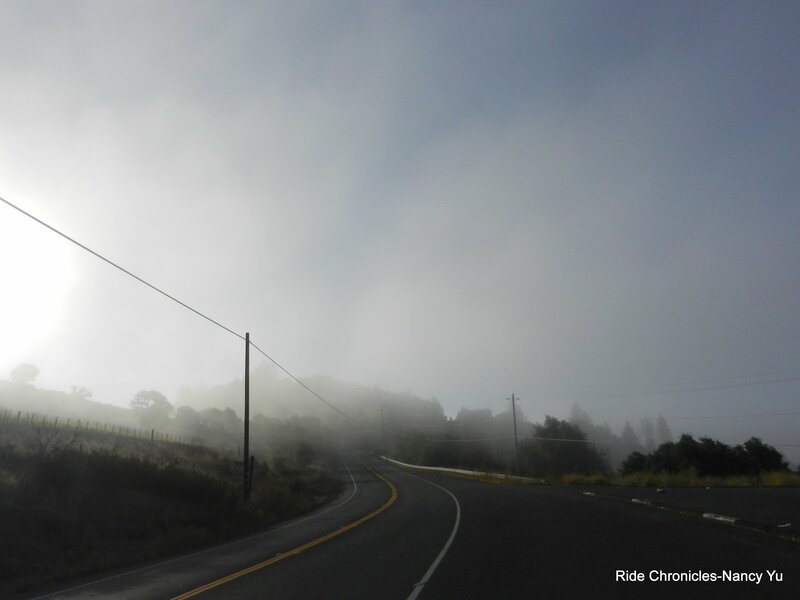 The gradient starts off at around 4% and increases to 7-8% as you get further along the climb. The descent on the back side is fast! 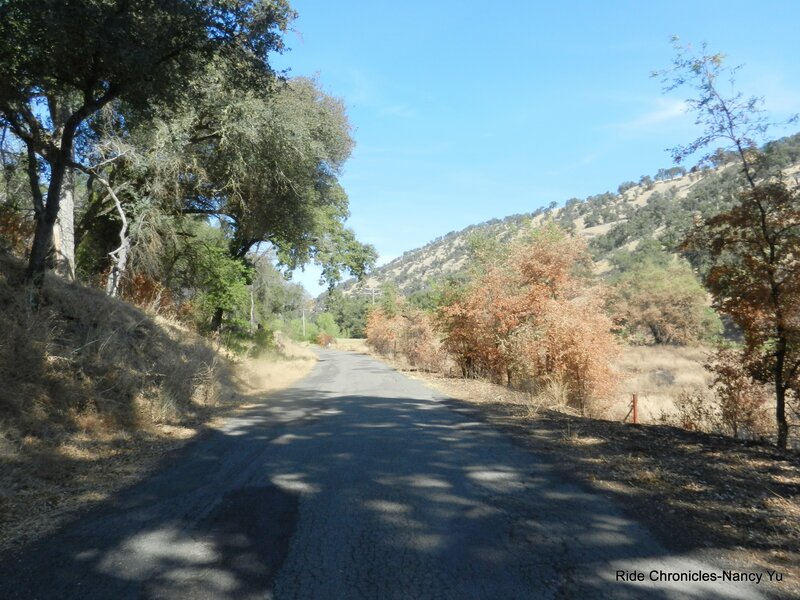 We take Atlas Peak Rd to Hardman Ave and Silverado Trail. 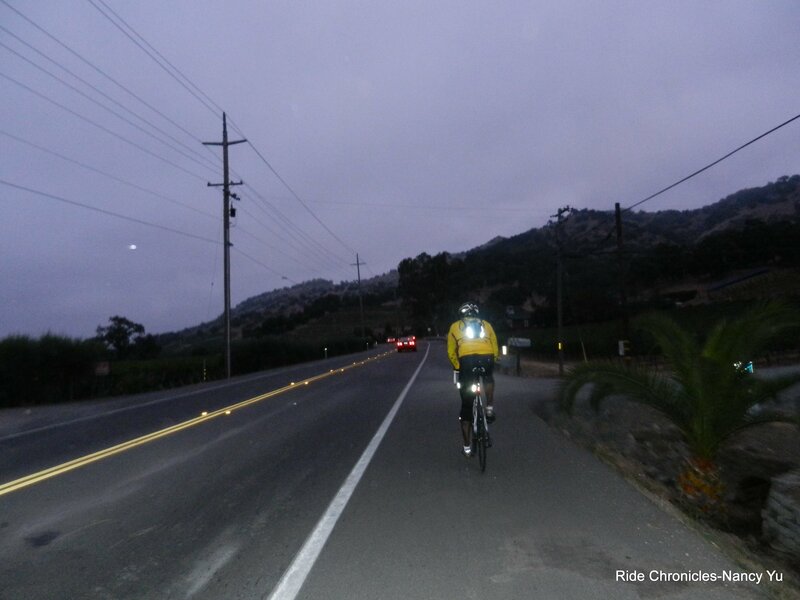 Daybreak occurs during our run along Silverado Trail to Yountville Cross Rd. There must be some other event going on today; I see several “official” looking guys setting up what looks like an aid station for maybe a running event with mileage markers along the side of the road. 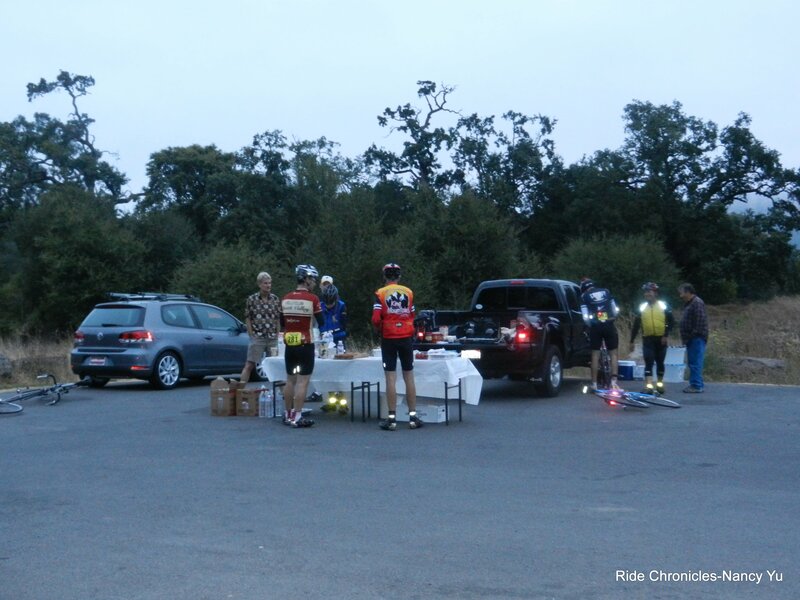 We arrive at Rest Stop#1-Napa River Ecological Reserve, mile 36.5 at 6:50 AM. 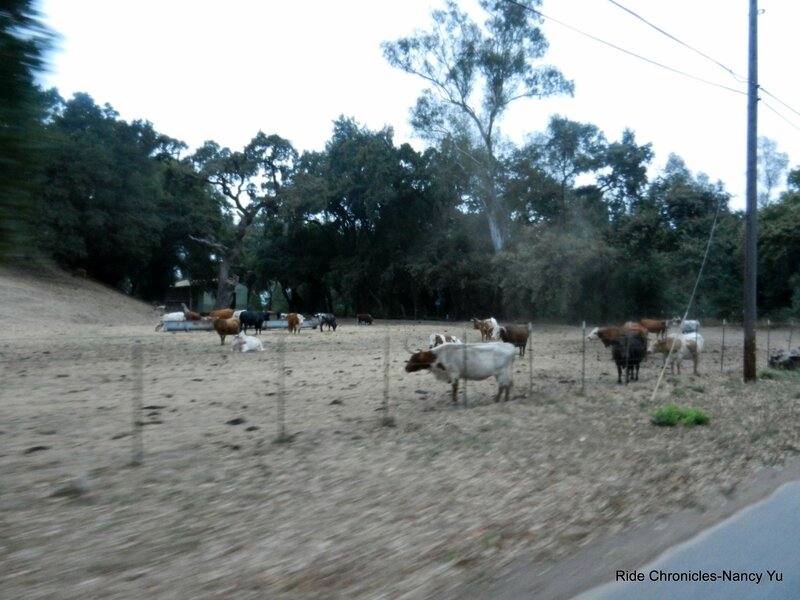 We continue on Yountville Cross Rd and ride through the vineyards and cattle ranch along Yount Rd and Yount Mill Rd. The route takes us on Hwy 29 to Oakville Cross Rd. It’s still early and there is virtually no traffic; a few hours later all the wine tasters will be out on the roads drinking and driving! 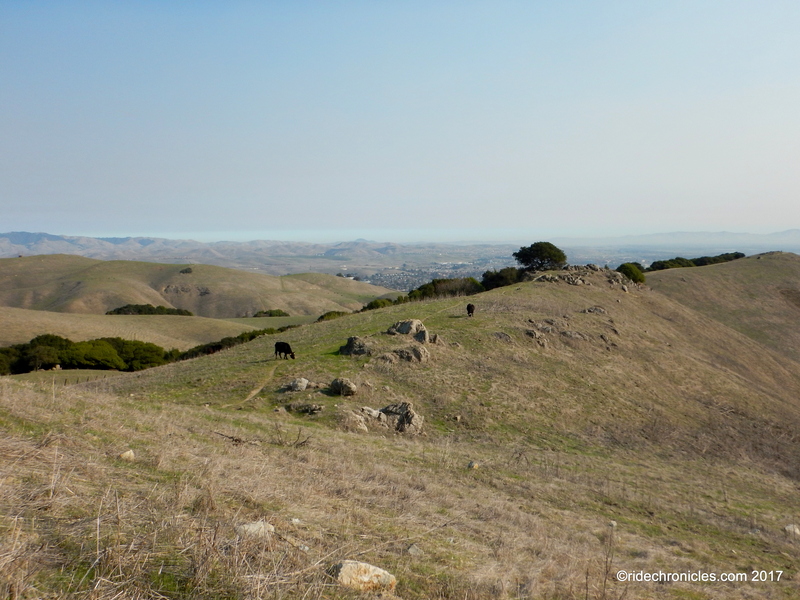 We turn onto Silverado Trail and head north for the next 7.4 miles. The terrain is fairly flat with a few small rollers. 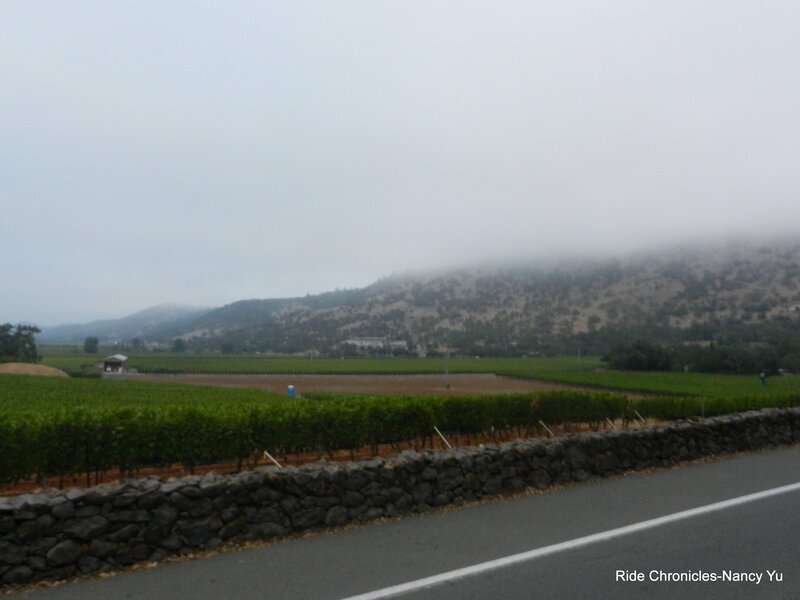 The picturesque views of the Napa Valley are quite beautiful; I can see why tourists and locals alike flock to this area. We exchange greetings with Ken E, Steve S and friend as they ride pass us. We turn onto Deer Park Rd for the steady 4.5 mile climb up to White Cottage Rd. It’s a 2 lane road with a decent shoulder area on very nice pavement. The gradient ranges from 6-8% with several steep sections of 10-11%. The fog up here adds to the calm and stillness that early morning brings us. It’s a great way to start the day and the air is so fresh! The sun is breaking through in the distance as we continue on; it’s an awesome sight to see! Gosh, If I wasn’t out here riding, I’d still be at home just sleeping all of this away! I hear the sounds of cyclists coming up from behind and it’s Denise P and friends. We exchange greetings and continue on with the climb. We make a left onto White Cottage Rd and I have to stop for a sec to pull out a nut bar, I’m really hungry. I make a mental note to eat a little more at the next rest stop. We stay on this road for the next 3.7 miles. 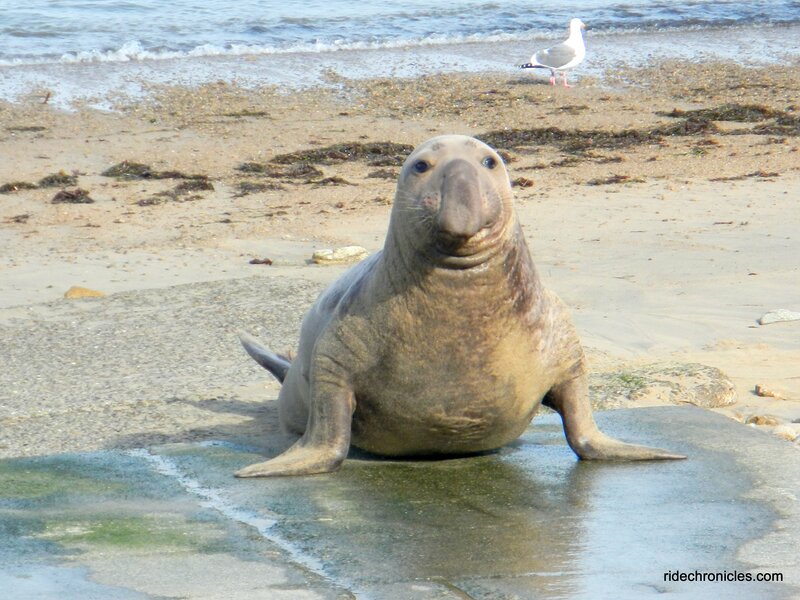 The skies are blue and the warmth of the sun feels wonderful! 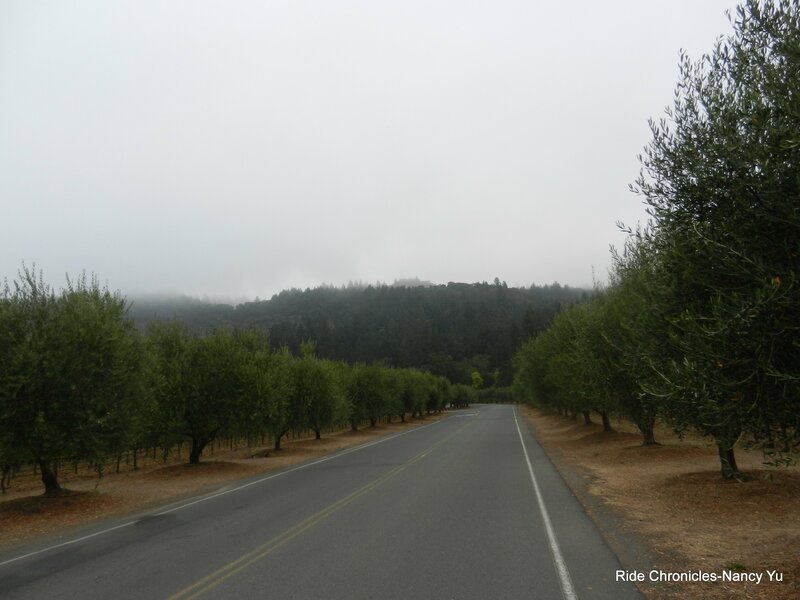 The 2.3 mile drop on Howell Mountain Rd to Pope Valley is very fast with a few tight turns. 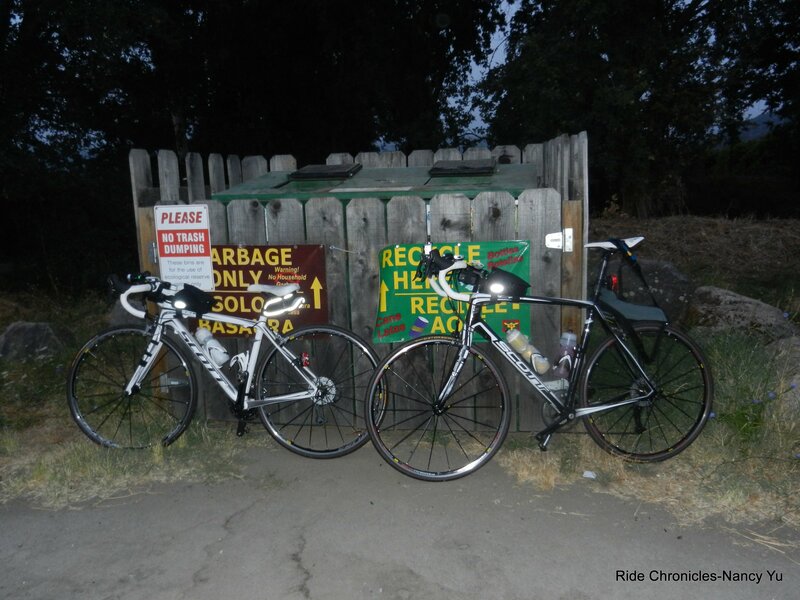 We make a quick stop to use the facility at the Pope Valley Store and continue onto Pope Valley Cross Rd. While making the turn, we ride right into a swarm of little bugs-YUCK! 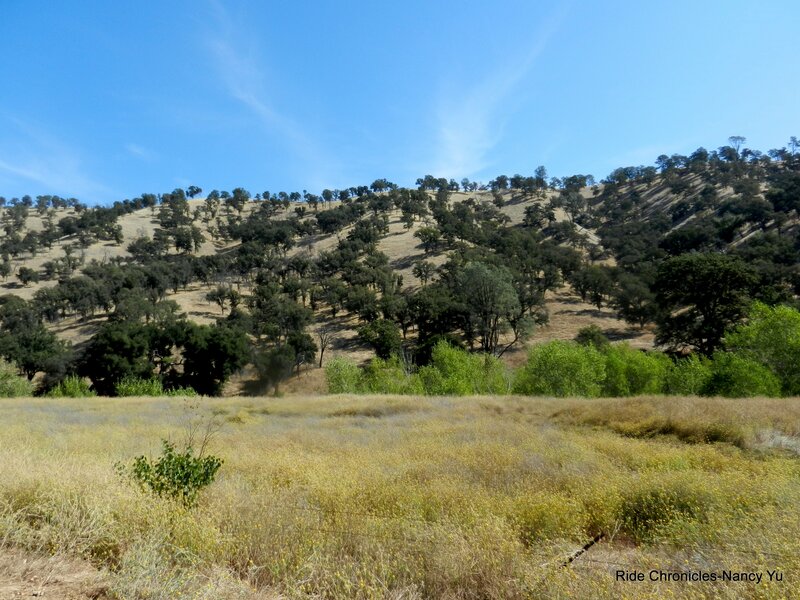 We move forward onto Pope Canyon Rd for the next 8.4 miles. 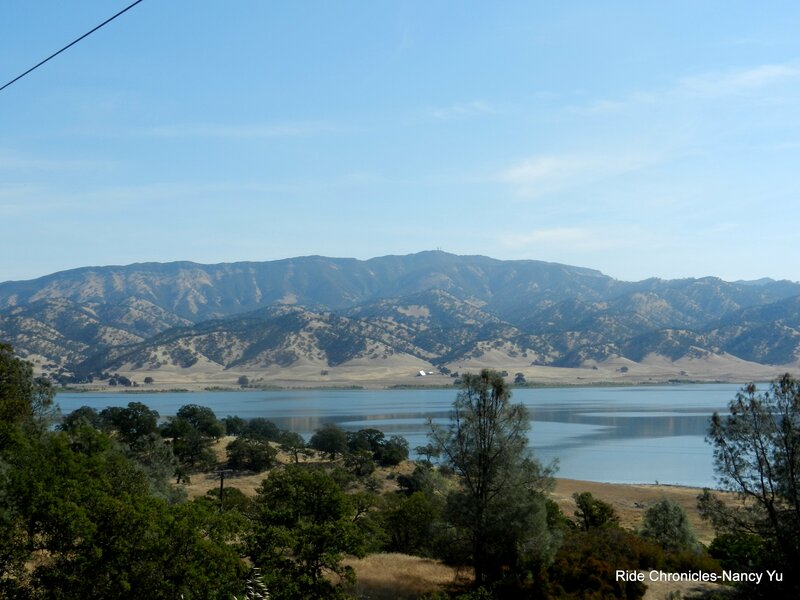 The rolling terrain and the few short climbs here brings us up and over to Lake Berryessa. 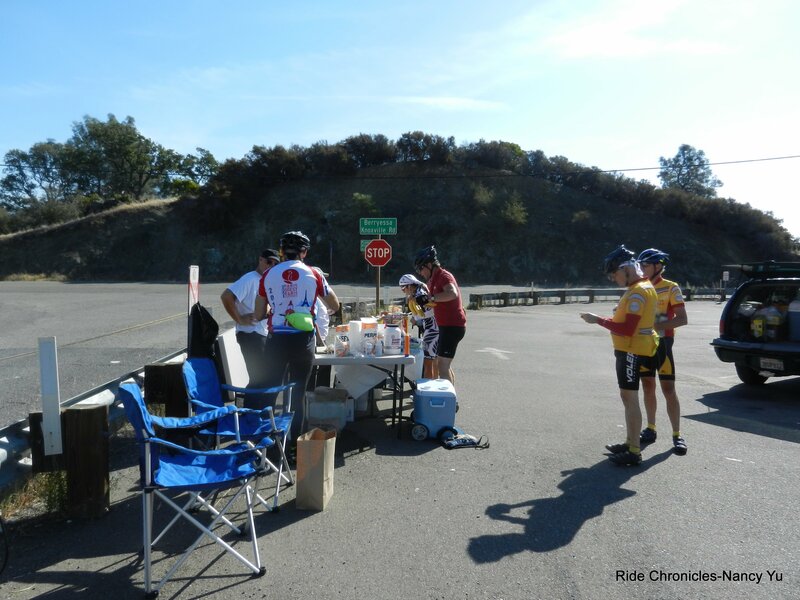 We arrive at Rest Stop#2-Knoxville Rd/Lake Berryessa, mile 72 at 10:05 AM. I remember to eat more; half a PBJ sandwich, half banana, some herbed potatoes, strawberries and half a bottle of Starbuck Frappuccino. The remainder of the Frappuccino will be forwarded to Rest stop #4 for me. Thanks to Cheryl! It’s warming up quite nicely so we remove our layers and put everything in a drop bag which will be forwarded to Rest stop#5 at Lake Hennessey-perfect! We head north on Knoxville Rd for the next 21.8 miles. Temp 81F. 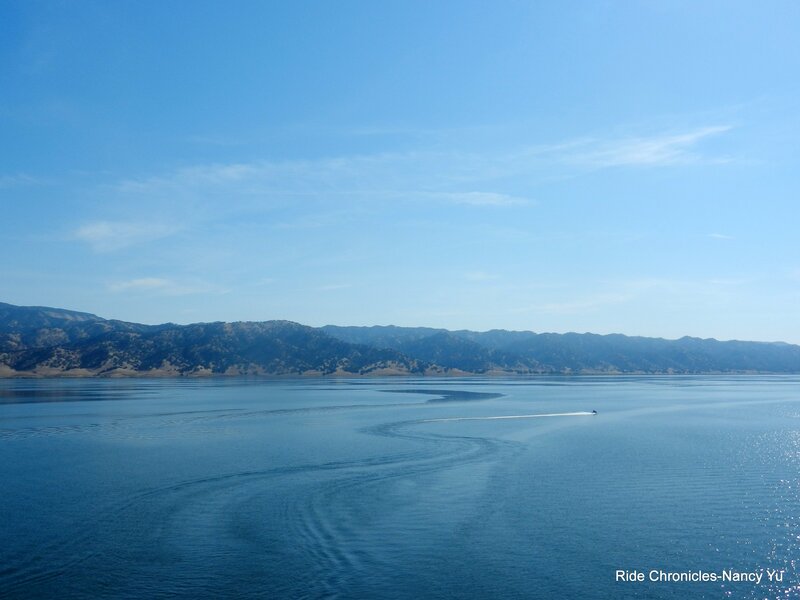 You get fantastic views of the lake and beyond. Surprisingly, there’s not much traffic at this time of day. After about 6 miles in, the two lane road becomes a single lane. 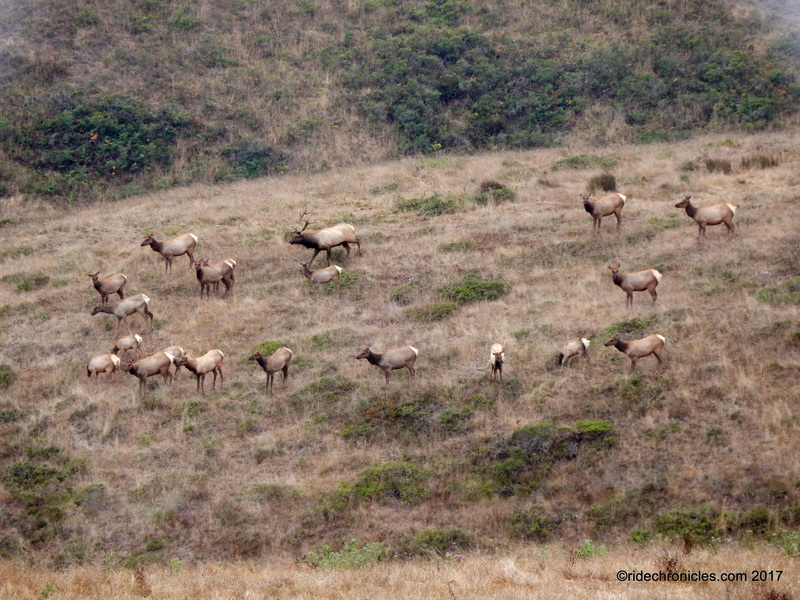 The only traffic here is the occasional hunter passing us by in their big trucks. 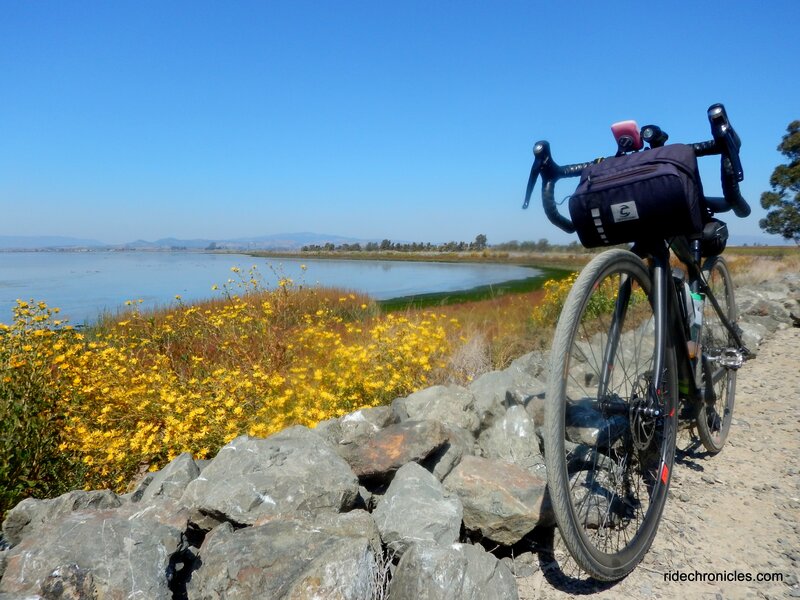 There are several dry creek crossings on rough concrete; watch out, your water bottle can fly off your bike! The overall condition of this road is very rough with lots of potholes; you can make a game out of dodging them. 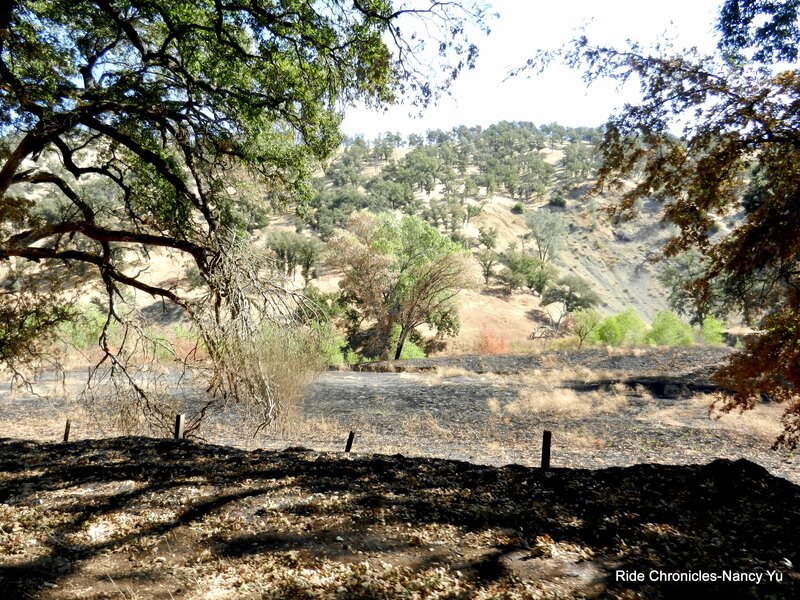 While looking around the area, I notice that the county has done a lot of control burns back here; it is quite dry. 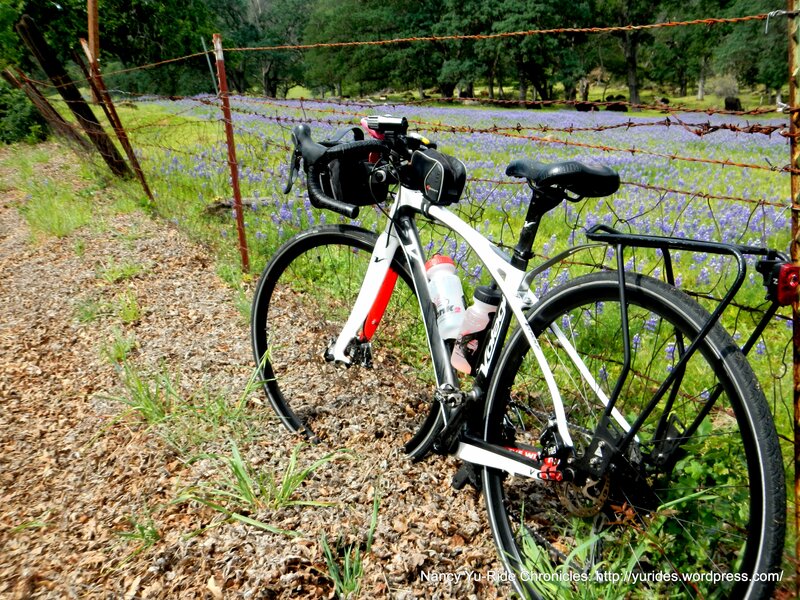 The majority of the terrain here is flat and rolling with a few 4-6% grades. The steep climb starts after the forced left turn-you can’t miss it! It’s actually a stair step climb; the first section starts off at around 4-7% and quickly jumps up to 10-14% as you near the top. The road then levels out to about 2-3% in between before the climbing starts back up again. It’s a steady double digit climb all the way up to the top. This whole back section is fully exposed to the sun and it is hot; temp 93F. We go through the tunnel and continue on for the next 1.4 miles and arrive at the Mini Water Stop, mile 93.8 at 12:30 PM. We still continue on Knoxville Rd for the next 15.1 miles, actually the road becomes Morgan Valley Rd about half way out. As I’m riding, I reach down for my water bottle and guess what, nothing’s there! I left it at the water stop-arghhhh! I turn around and go back to retrieve my bottle, fortunately I’m only about a mile away. Michael waits for me and we’re off again. 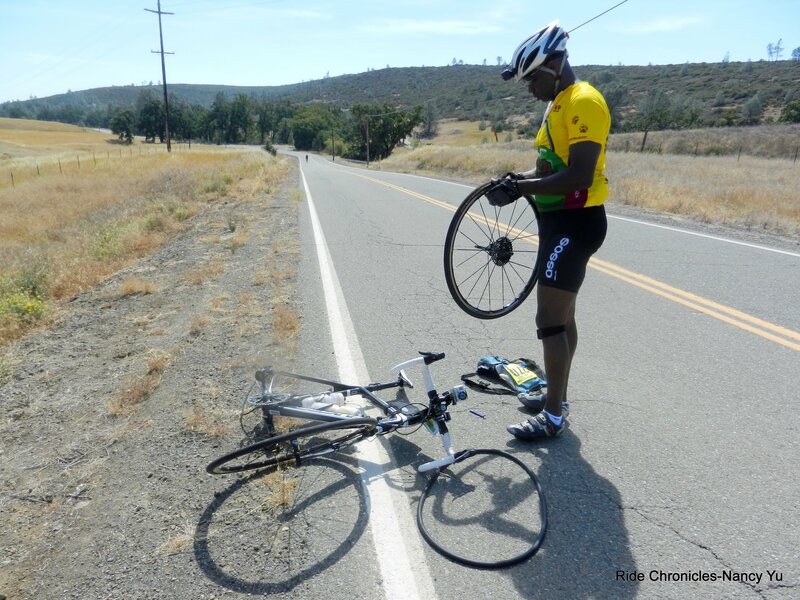 Further along the road, Michael calls out to me, he has a flat. There is absolutely no shade out here; it’s hot! I look at my odometer and it reads 97F. Several other riders pass us by while Michael is changing out the tube. 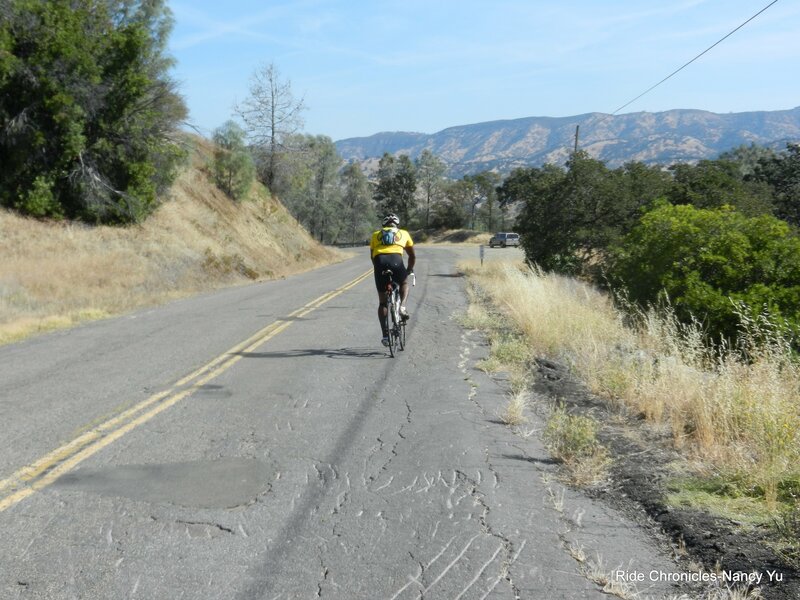 There are several climbs on Morgan Valley followed by a very fast descent; you think you’re done climbing-NOT! There is another long climb with gradient ranges of 9-13%. Once you get around the last left hand guard rail, you are so ready for the descent into Lower Lake. We reach Rest Stop#3-Foster Freeze/Lower Lake, mile 108.9 at 2:08 PM. 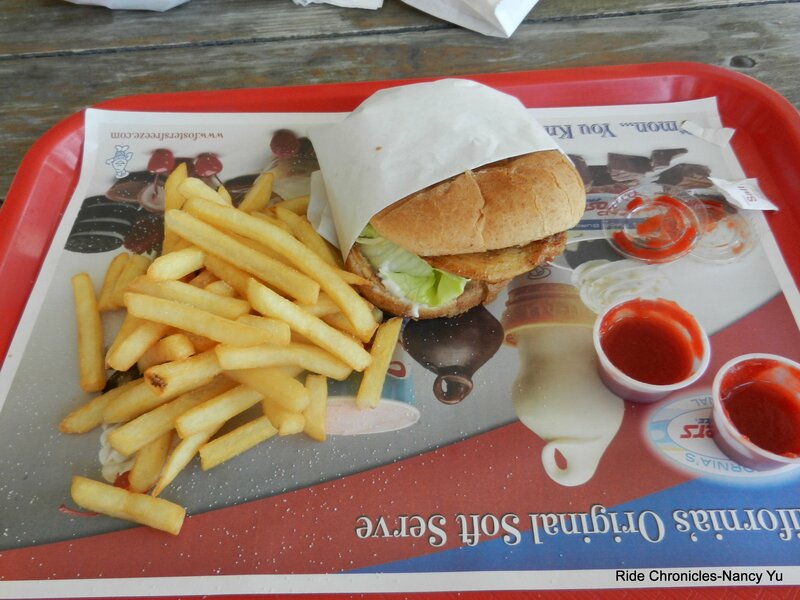 We both order a combo meal: grilled chicken sandwich with fries and a drink. This is like a treat; I never get to eat this on a DC. We’ll see how well it fares with my stomach as the ride progresses. 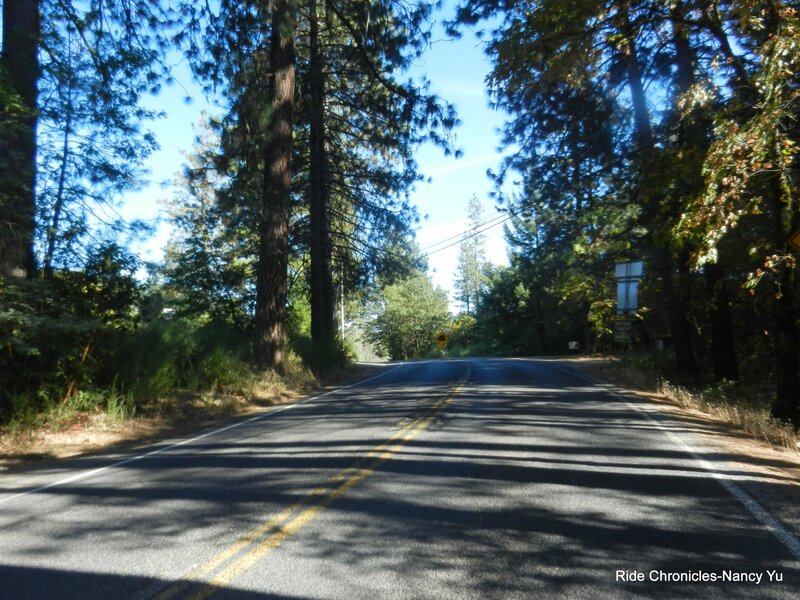 The next climb on the course is on Siegler Canyon Rd. It’s 4 miles long with starting grades of about 4-5%. 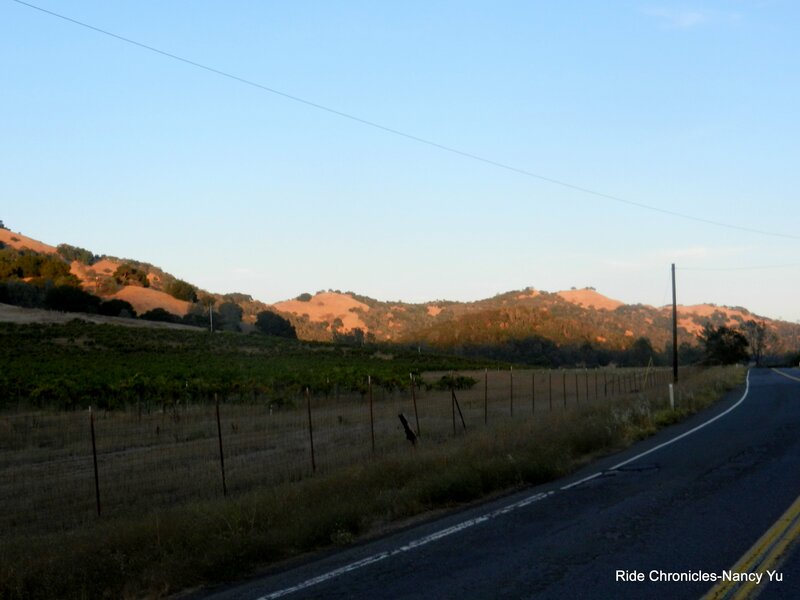 The road levels out to about 2-3% as you ride under the shade and increases again to about 6-7%. It maxes out at 13% as you near the top. The mild breeze helps cool us down. It’s 91F here. You can hear water trickling along the creek as you make your way up to Loch Lomond Rd. The climb up Loch Lomond is much steeper but it’s also much shorter. it starts off gradually at around 3-4% and increases to 7-8%. 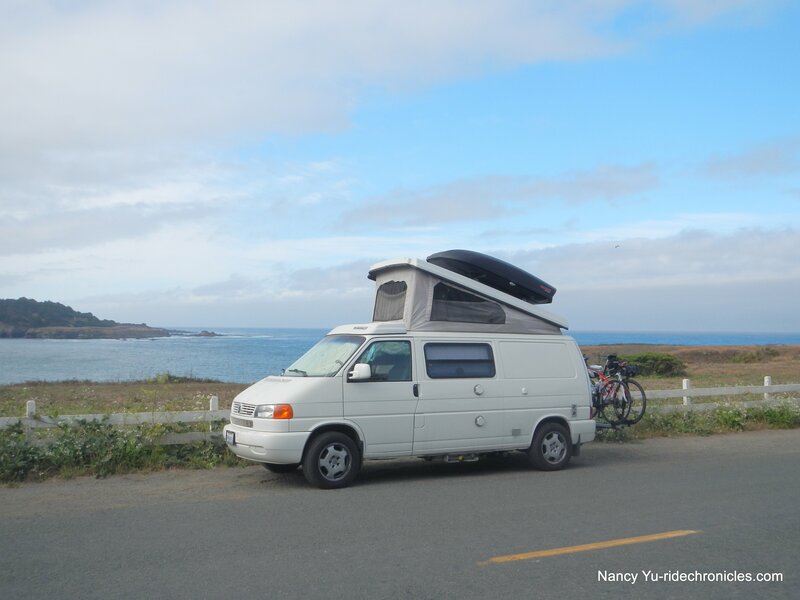 The steepest sections hit 10-13% as you near the upper portion of the road. Once you reach the “top”, there are a series of rollers that will take you over to Cobb Mountain. 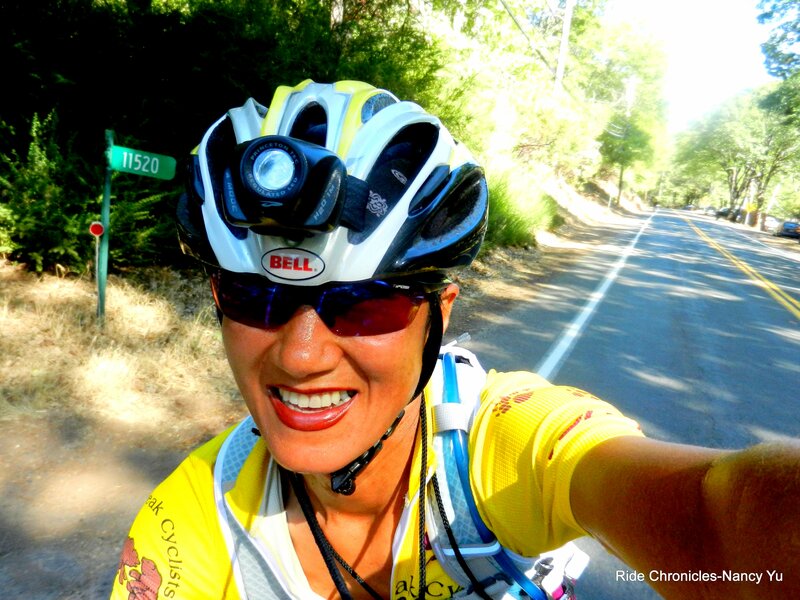 We reach Cobb Mountain and continue climbing on Hwy 175 before reaching Whispering Pines. The last short pitch up on Hwy 175 leads us to the blasting fast descent down Cobb Mountain. We reach the bottom of Hwy 175 and cross 7-8 sections of the road that have been recently graded for repavement. 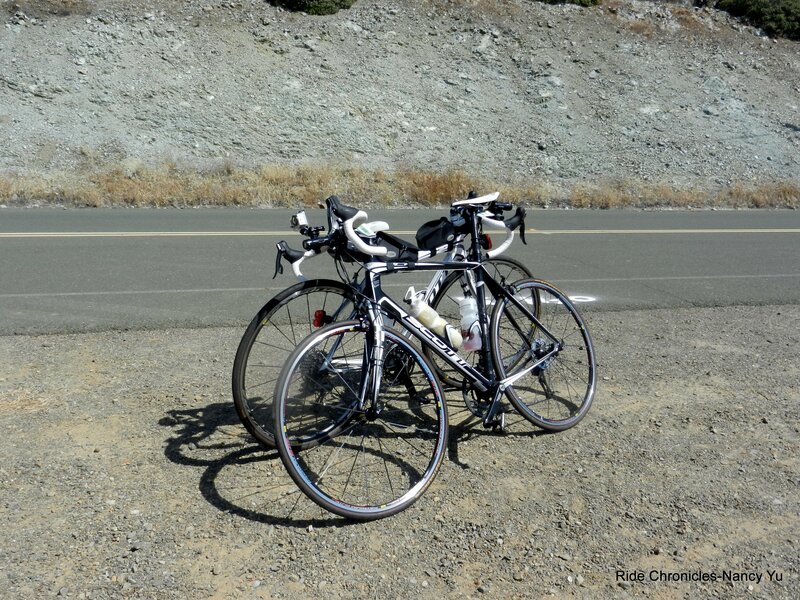 There are perpendicular grooves that are just wide enough for a bike tire to get caught in-proceed with caution! Hwy 175 leads us through Middletown, we cross Hwy 29 to stay on Main St. The back roads on Jefferson and Wardlaw take us across the old bridge to St Helena Creek Rd. It’s a nice detour to avoid the heavier traffic on Hwy 29. We continue on Butts Canyon Rd for the next flat 5.1 miles. I can smell the fragrance of wild sage all along this road. 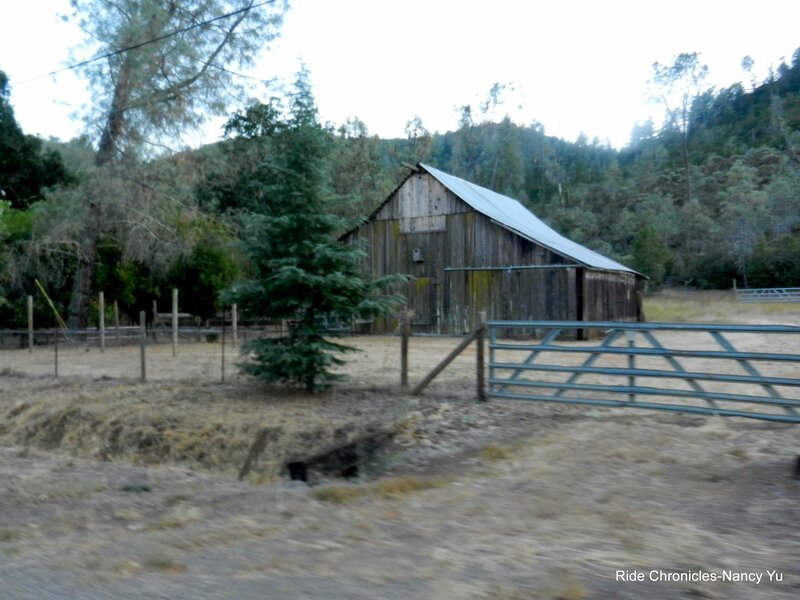 There are nothing but wide open meadows and pastures with old farm houses and horse ranches. We arrive at Rest Stop#4-Detert Reservoir/Pelican Lake, mile 135.9 at 5:15 PM. 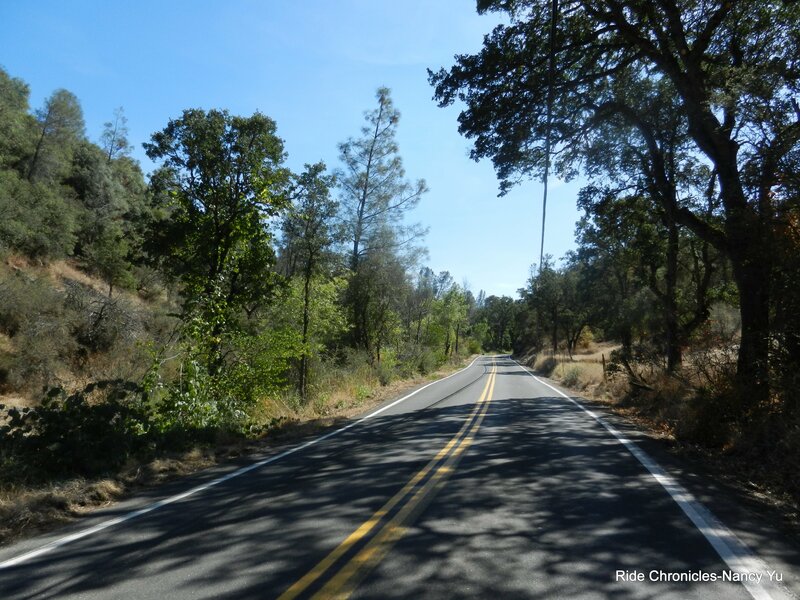 We stay on Butts Canyon Rd; it’s a nice section of road with minimal traffic. 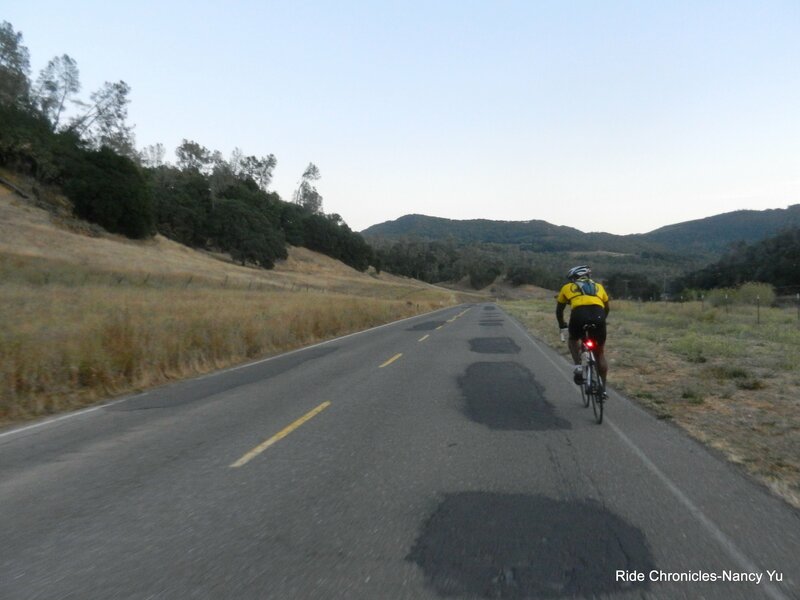 The climbs up and over to Pope Valley have gradient ranges of 5-8% and max out at 10-12% as you near the top. 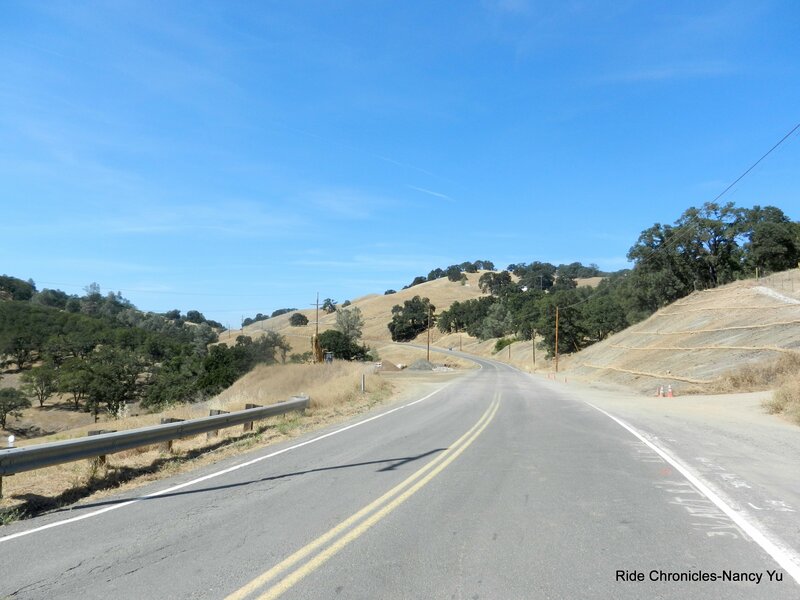 The road changes name and becomes Pope Valley Rd. 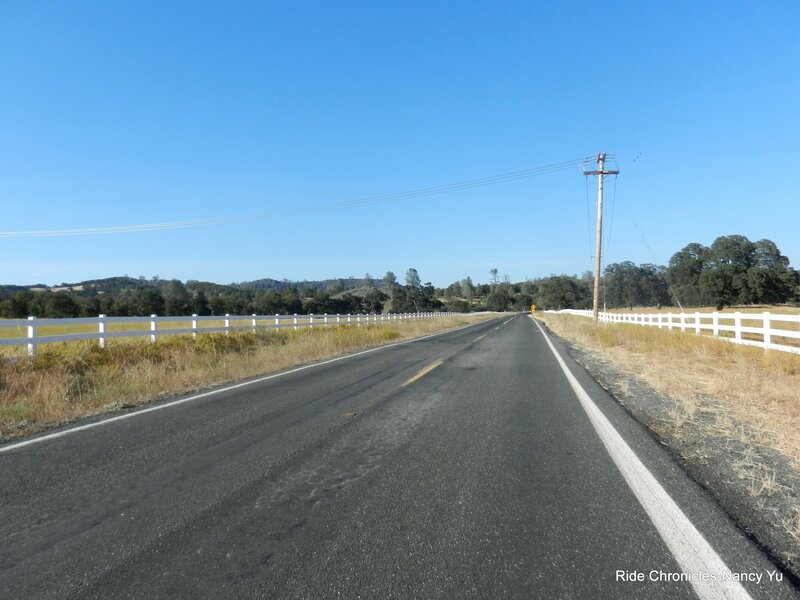 The run along Pope Valley Rd is a slight decline with a few rollers in between. 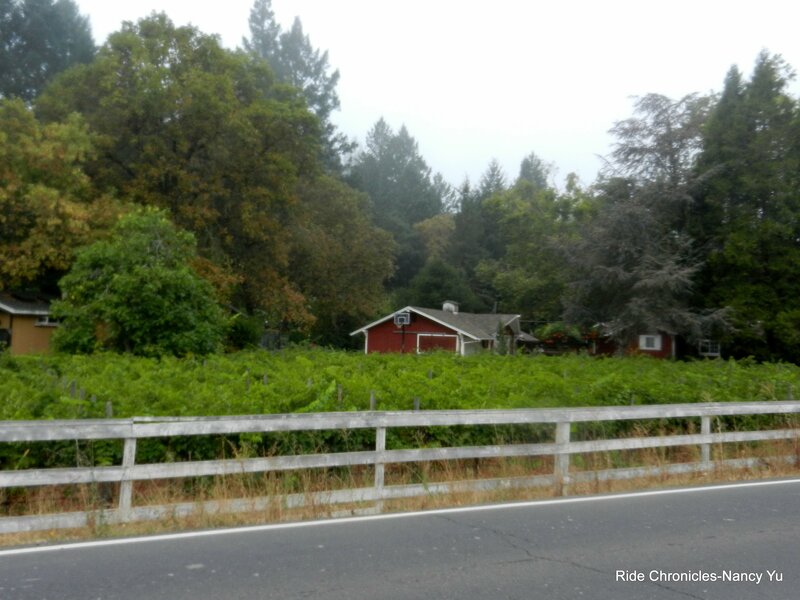 We ride pass plenty of vineyards, old barns and the prerequisite junk yard type areas with abandoned equipment and vehicles. 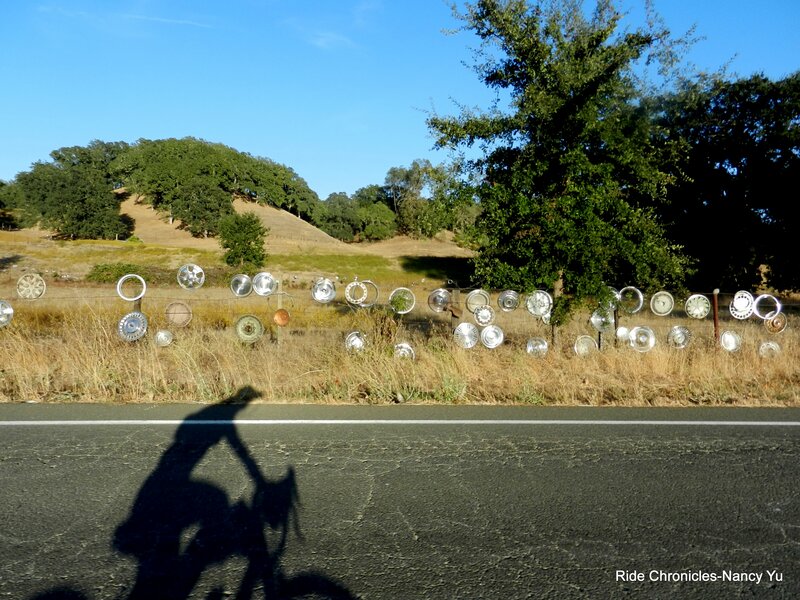 The sight of all the hubcaps hanging along the fence at Hubcap Ranch always has me smiling. The sun is beginning to set and creating shadows everywhere. It’s gorgeous out here! There is a quick pit stop at the store before we continue on Chiles Pope Valley Rd. 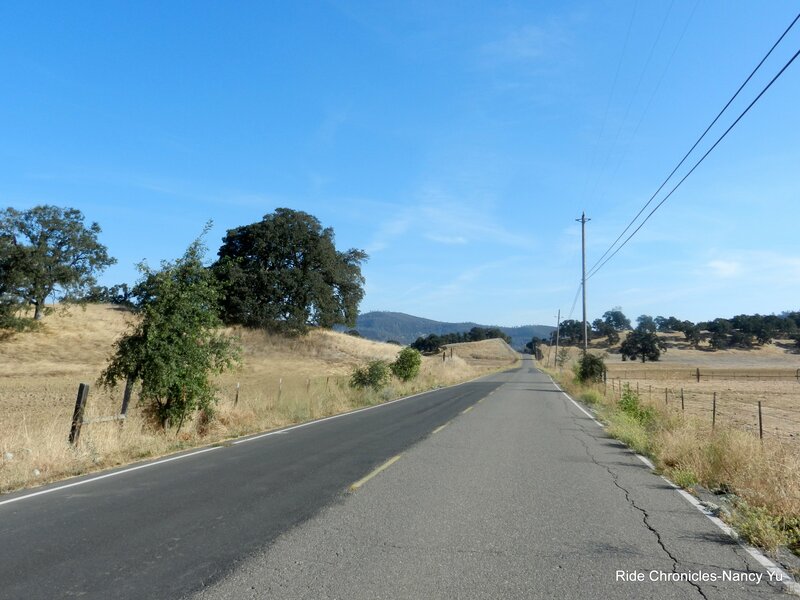 There is a 4-5% climb out of Pope Valley and a series of small rollers along this road. I think the road conditions have deteriorated even more since the last time I was out this way. It’s really bumpy with lots of rough patches. It’s still feeling pretty nice out here; it’s a balmy 76F. 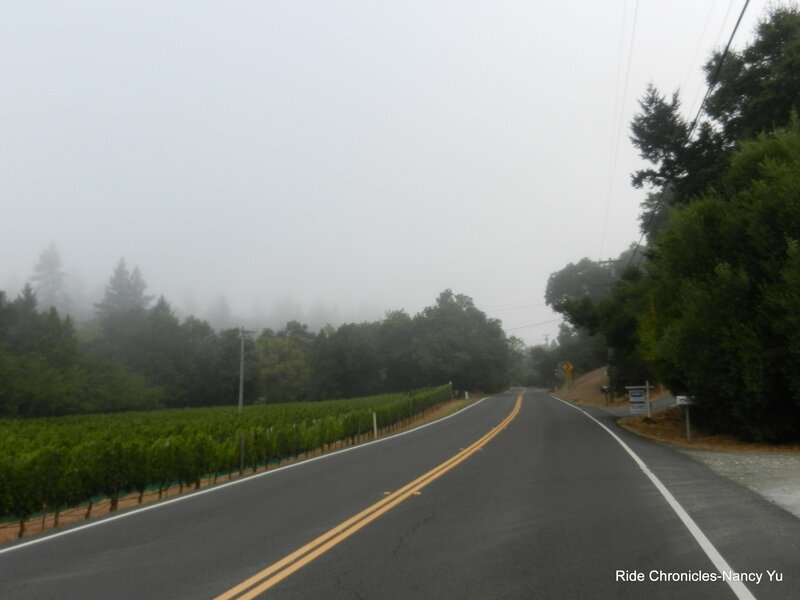 The 3.6 mile sweeping descent comes after you pass the last vineyard on the left. 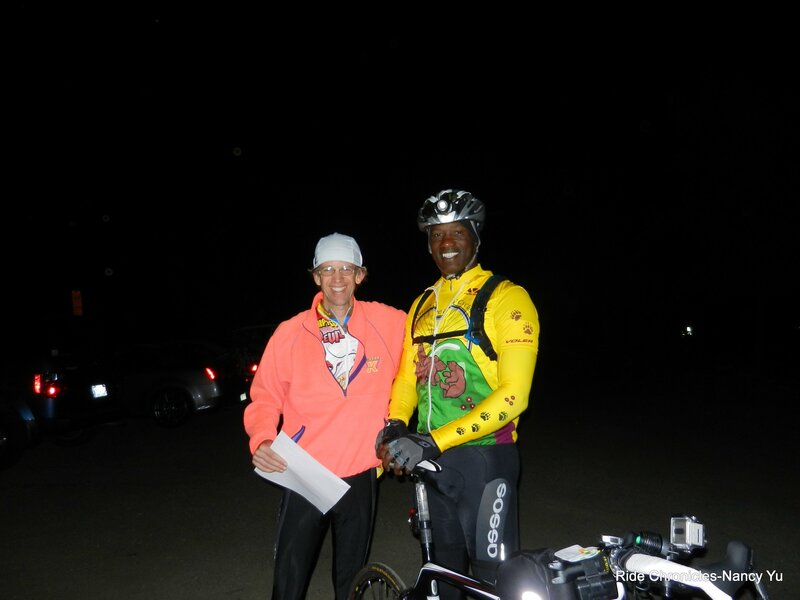 We reach Rest Stop#5-Lake Hennessey, mile 161.5 at 7:15 PM. I always have a chicken cup o’ noodles on these rides. The salty broth and noodles are very satisfying. We get our drop bag and layer back up for the remainder of the ride. are a few cars that pass us but traffic is surprisingly light for a Saturday. 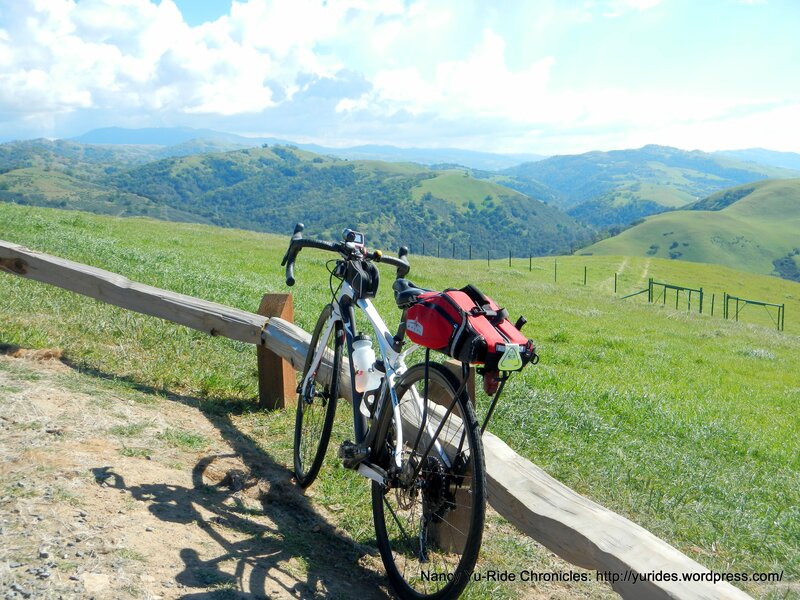 There are a series of short climbs and descents before we reach Turtle Rock. 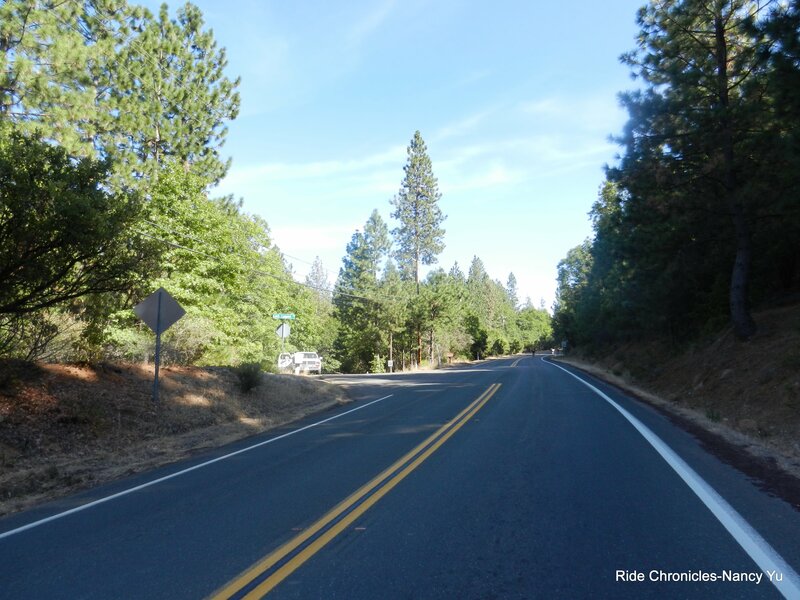 We stay on Hwy 128 and head south for the next 4.5+ miles to our next turn at the junction of Hwy 128 & Hwy 121. Stay on your left to head north and continue on Hwy 128 for the next 15 miles. 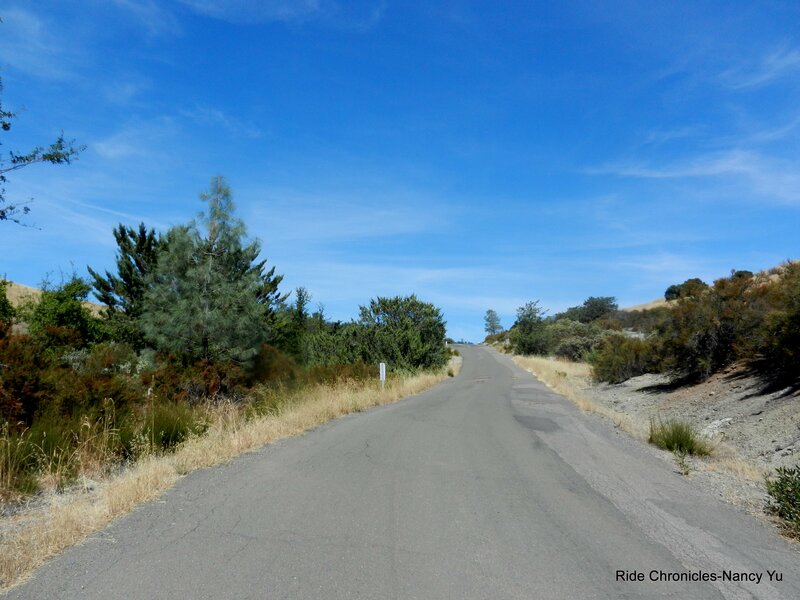 There are long stretches of flat road with several climbs that includes the backside of Cardiac Hill. The gradient ranges from 6-7% and maxes out at around 9%. I catch a glimpse of all the lights at Markley Cove Resort and look up to see all the stars in the sky. It’s a very clear night with the moon nowhere in sight. 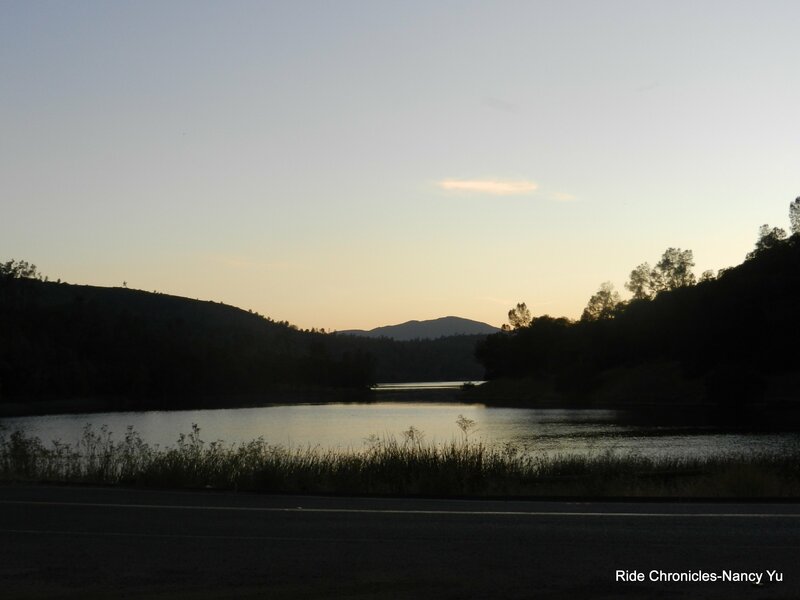 I hear the echoing sounds of crickets and can smell the strong fragrance of Jasmine flowers in the air on the climb up towards Monticello Dam. How lovely that is! Once you’ve passed the dam, it’s all downhill with a few small rollers in between. The air is still warm-it’s 72F. I can also smell smoke in the area but couldn’t see anything in the distance. The temp does drop a few degrees as we ride along Putah Creek. We reach the intersection with Pleasants Valley Rd, mile 189.1 at 10:05 PM. The remaining 12.6 miles on Pleasants Valley is on rolling terrain with a couple of short climbs in between. At the top of one of the climbs, there was a German shepherd dog running loose so I slow down and can hear Michael yelling at it from behind. 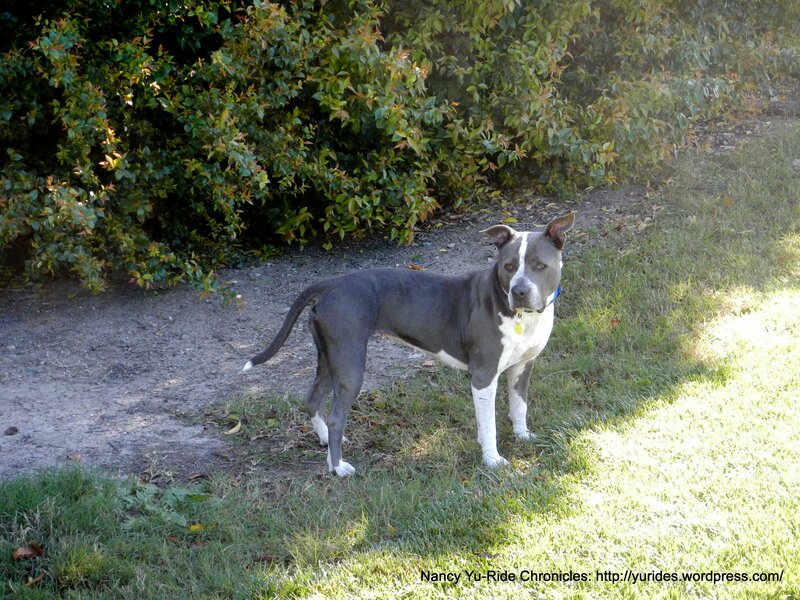 The dog just runs steadily along the side of the road. We only have a few more miles to go till we reach Cherry Glen Rd. Michael calls to me to look up to my left and lo and behold, there’s the moon! I also see the flickering of the street light at the T intersection from the distance and we’re less than a mile from the finish. 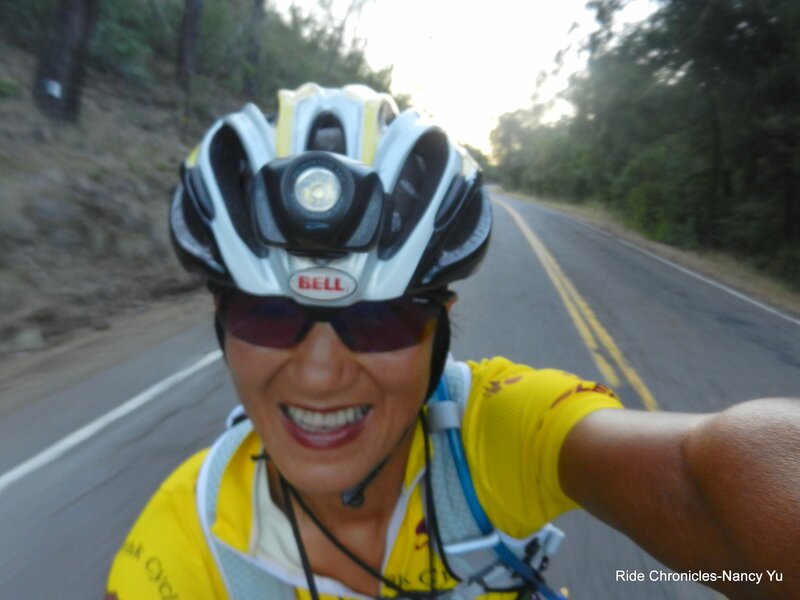 We hang a left on Cherry Glen, cross the Fwy overpass and arrive at Pena Adobe Park at 11:05 PM. We both check in-we’re done! 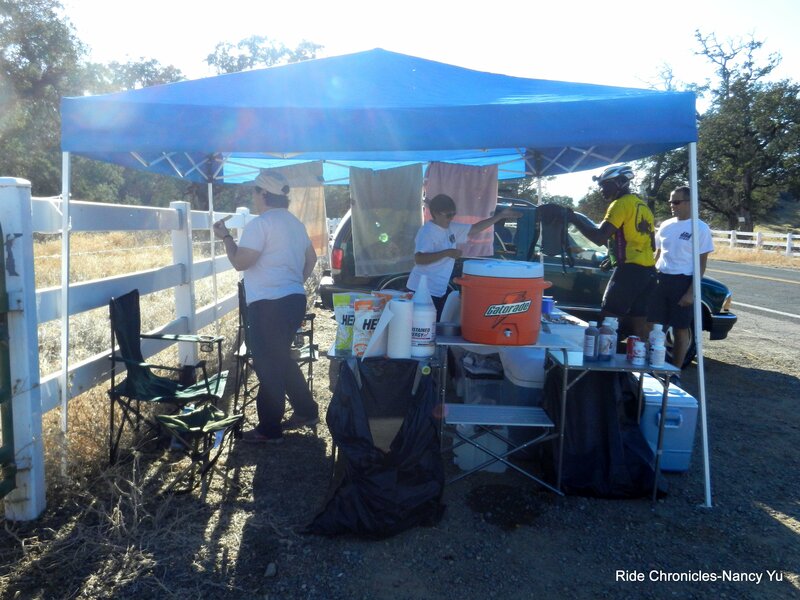 Thanks to all the Quack volunteers-Jesse Smith, Dan Hertlein, Cheryl Hopkins, Timothy Bartoe, Kathy Owen, Eric Senter and Scot Castle for being out there to support us and to Scott for organizing such a fantastic ride! The weather was perfect too! 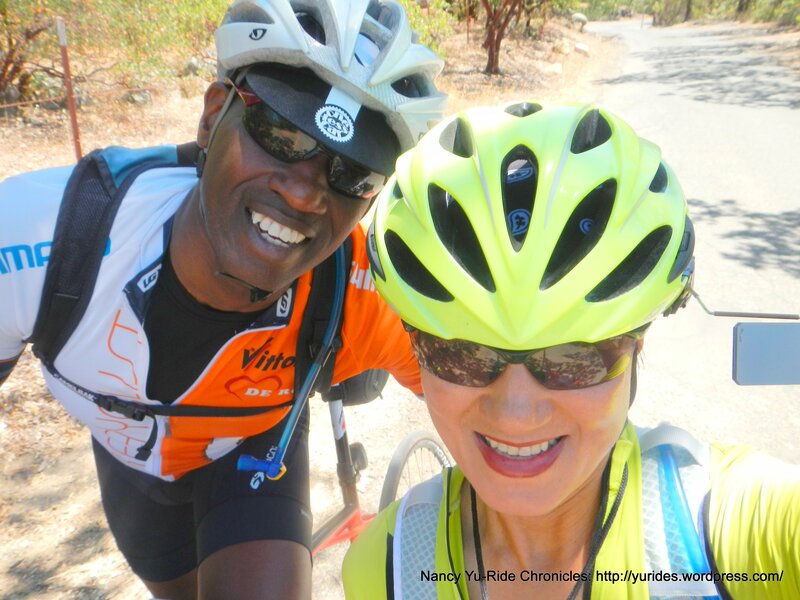 Michael and I are volunteering for the pre-registration the evening before the ride and will be at Rest Stop #1-Napa River on 09/24. Come on by and say “hi”! Weather: FABULOUS! Early morning fog turning to brilliant sunny blue skies. Starting temp of 57F, reaching a high of 97F and dropping down to 65F at the finish. Mild winds throughout the day. 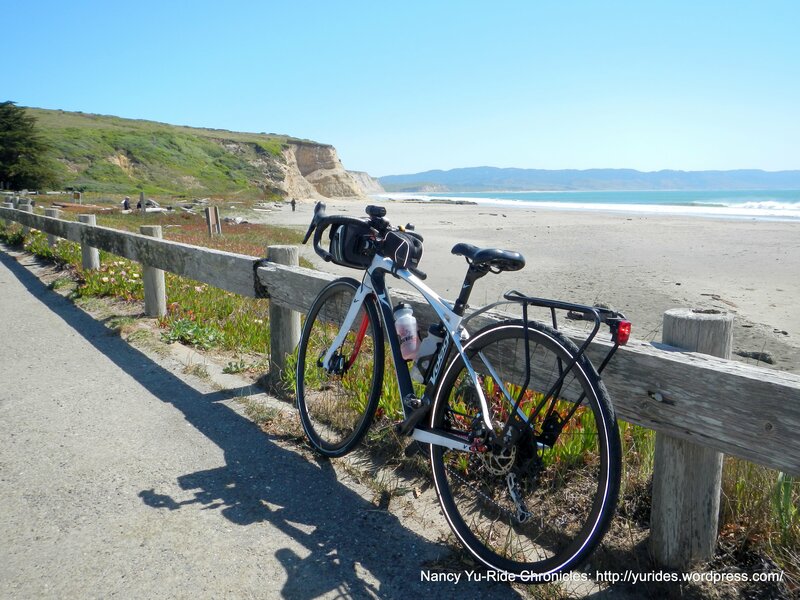 Thanks for the writeup, sounds like a fun ride! 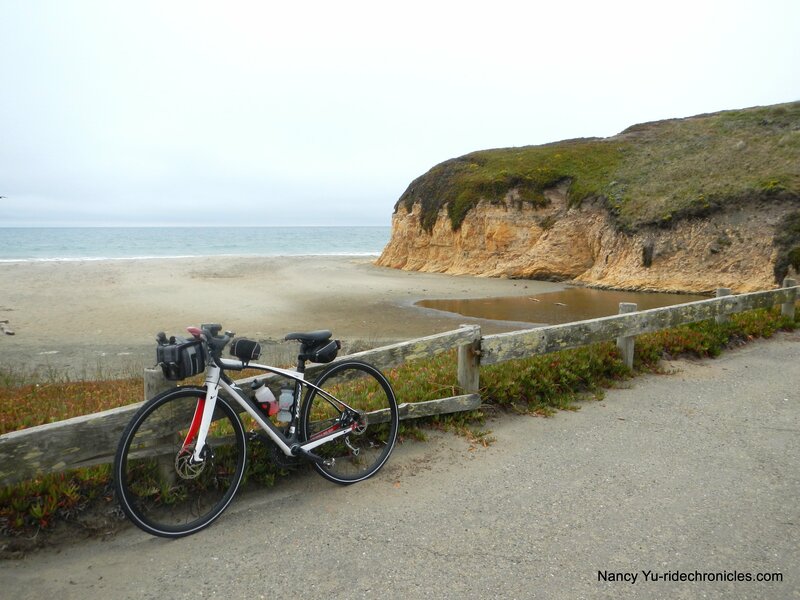 Good write-up, as usual – it really helps to know about road conditions and route changes. I’m living in Idaho these days, but am in the Bay area for a week, and decided to give Knoxville a shot, so I’ll plan to see you at the rest-stop on Saturday. Thanks so much for volunteering! Your posts are so enjoyable to read, from the comforts of home, even the Oooh … temperatures maxing out at 97 just in time for the flat! Like your new bikes with camera mount. First of all thanks for volunteering for the official ride! It was nice to meet you and Michael. 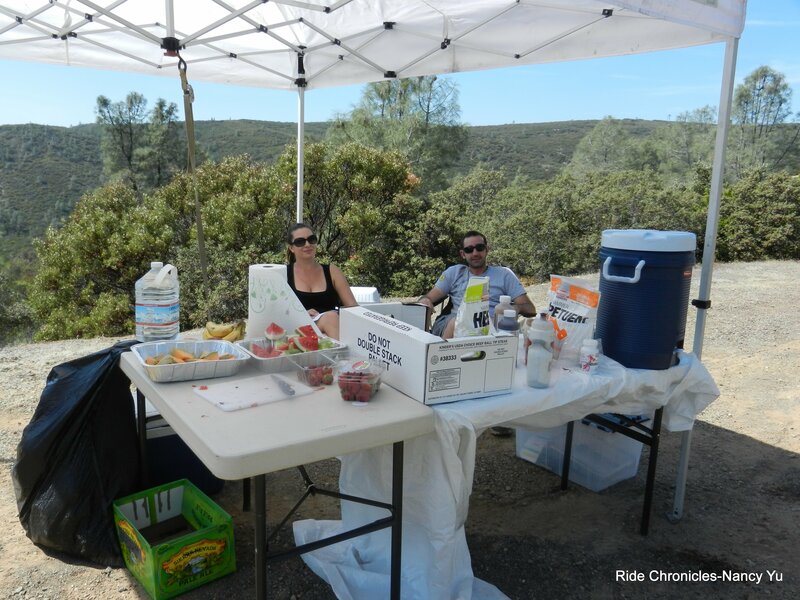 All the volunteers took great care of us riders throughout the day and kept us well fed, hydrated and motivated. 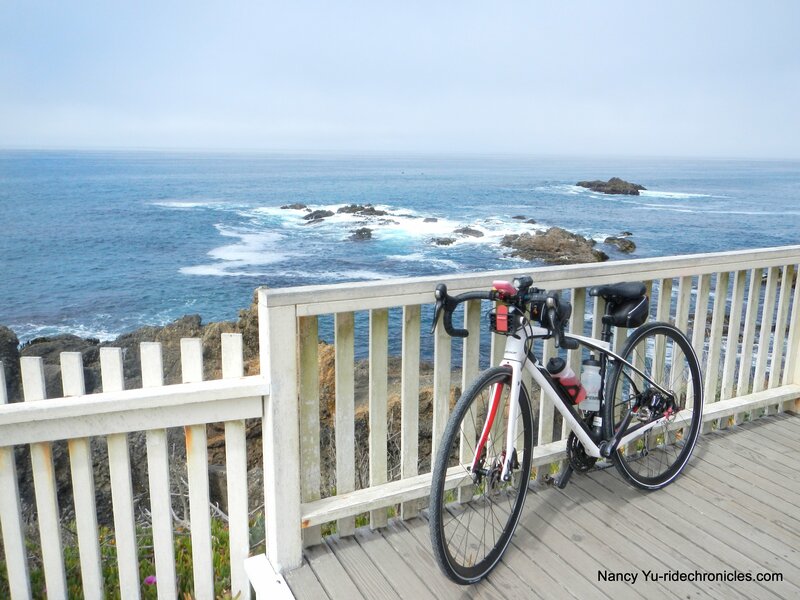 Your excellent write up helped me with the mental prep for the ride. There were no surprises.